Arena di Serdica five star-rated Residence Hotel was opened in 2007. It is a part of the Bulgarian hotel chain FPI Hotels & Resorts. The hotel is a unique property which gives you an exciting journey in the past and takes you centuries back to the history of Serdica. Here you can see the ancient remains of Serdica amphitheatre dating from ІІІ – ІV centuries AD. Arena di Serdica Residence Hotel was certified by the prestigious International certificates ISO 9001 – for quality hotel management and tourism services and ISO 22000 – for quality management of restaurants and foods. It was also certified for cleaner production. 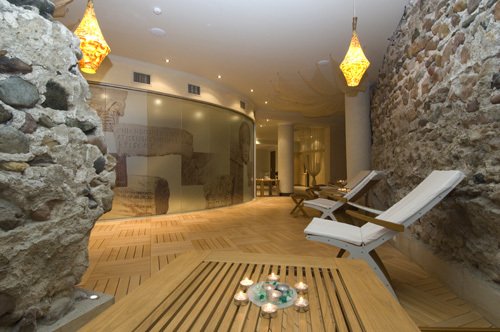 It was awarded for “The Best Bulgarian Boutique Hotel 2007” by the readers of The Travel Magazine. 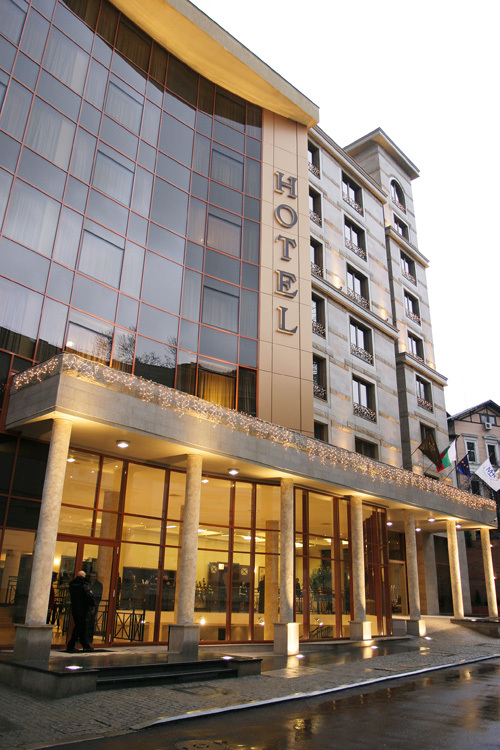 The hotel is located in the downtown of Sofia near important government and financial institutions, business and tourists sites like Alexander Nevski Cathedral, Russian church, theatres, museums, galleries. The hotel is also located close to the commercial area of the city. 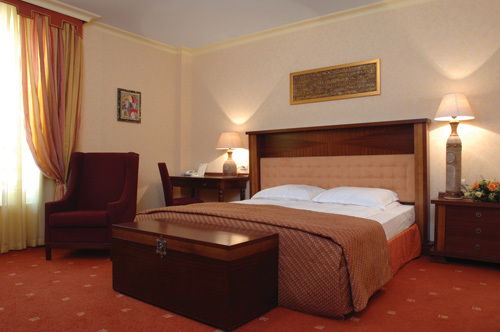 The distance between the hotel and Sofia International Airport is 12 km. 40 luxury rooms and 23 stylish apartments with all modern business and leisure facilities. The hotel is a unique property for Bulgaria due to the ancient excavations of Serdica amphitheatre discovered during the ground survey for the hotel building. La Tribuna is the main restaurant of Arena di Serdica Residence Hotel which offers European cuisine with a special focus on the Bulgarian dishes. Here you can enjoy the relaxing atmosphere, find tempting culinary suggestions and your favourite wine. La Terrazza di Serdica Panorama Restaurant is situated on the top floor of the hotel. It offers exquisite International cuisine, healthy dishes, fine wine selection, excellent service and a sunny terrace with a magnificent view towards the Vitosha Mountain and the city center of Sofia. The Lobby Bar will charm you with its unconventional interior with a nice view towards the ancient remains of the antique amphitheatre of Serdica. Arena di Serdica Residence Hotel has four fully-equipped conference rooms - Arena (up to 100 guests), Serdica (up to 40 guests), Sofia (up to 30 guests) and Forum (up to 20 guests). Arena hall is fitted out with ORT multifunctional chairs, simultaneous interpretation boots and a conference bar. The Serdica and Sofia halls have the advantage of natural daylight. The equipment supplied includes multimedia projector and projection screens, flip chart, sound and video services (upon request), telephone line, air-conditioning with individual temperature regulation, Internet access. The hotel also provides a Business Centre offering full range of services - computer, printer, fax, telephone line, Internet access. 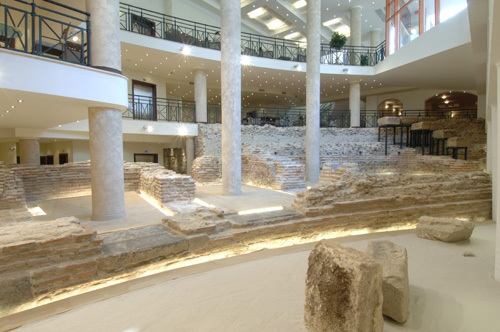 The restored part of the ancient amphitheatre of Serdica is properly preserved and exposed at the ground floor of the hotel.